The House Chamber, also known as the "Hall of the House of Representatives," is a large assembly room located in the center of the U.S. Capitol's south wing. Members of the House of Representatives sit in unassigned armchairs arranged in a semicircle on tiered platforms that face the Speaker's rostrum. Behind the rostrum is a frontispiece with Ionic columns made of black Italian marble with white Alabama marble capitals. An American flag occupies the center and is flanked by two bronze fasces. The chamber's lower walls are walnut paneled with intervening light grey Genevieve Sheldorado marble pilasters. A gallery for visitors and the press corps rings the chamber on the upper level. The 23 marble relief portraits over the gallery doors of the House Chamber in the U.S. Capitol depict historical figures noted for their work in establishing the principles that underlie American law. They were installed when the chamber was remodeled in 1949-1950. 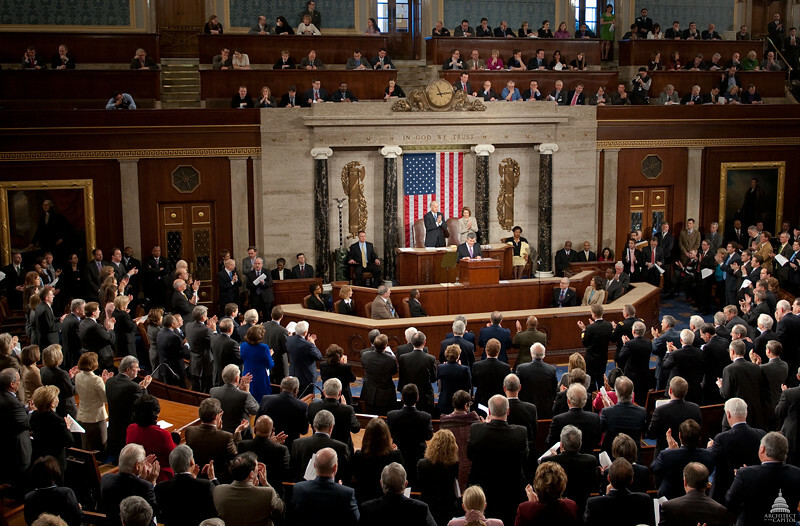 The House of Representatives first used the chamber on December 16, 1857. It was designed by Thomas U. Walter, the architect of the U.S. Capitol extension, who planned the room without windows in order to insulate the members from outside noise and interference. Natural light was provided through a large skylight and fresh air was introduced by steam-powered fans. The ceiling and the remaining high-Victorian design features were removed during the chamber's reconstruction that took place in 1949-1950. One of the most dramatic alterations occurred when the elaborate iron ceiling and stain glass skylight were replaced by a stainless steel and plaster ceiling. These design changes were meant to rid the room of its Victorian past and replace it with architecture from the early republic.